Liberals and Real Wages | This is Ashok. The way a given worker or class of workers improves his real wages is by persuading his boss to give him a nominal raise that outpaces the growth in the cost of living. But the way the economy as a whole works is that my income is your cost of living. If Slate doubled my salary, I’d be thrilled. But if everyone’s boss doubled everyone’s salary starting on Monday, we’d just have one-off inflation. As it happens, a little inflation would do the macroeconomy some good at the moment. But the point still holds that while “you get a raise” is the way to raise your living standards, “everyone gets a raise” is not the way to raise everyone‘s living standards. This is partly true, but also hazy thinking, and less true than it has ever been. The math behind this is quite simple. 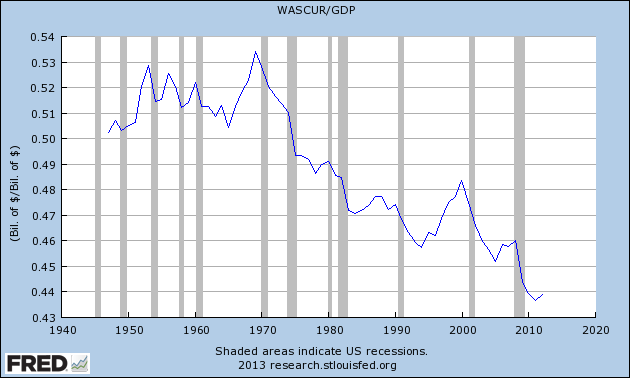 If wages are n% of a firm’s cost of production, for the inflation to be “one off”, n would have to be 100. 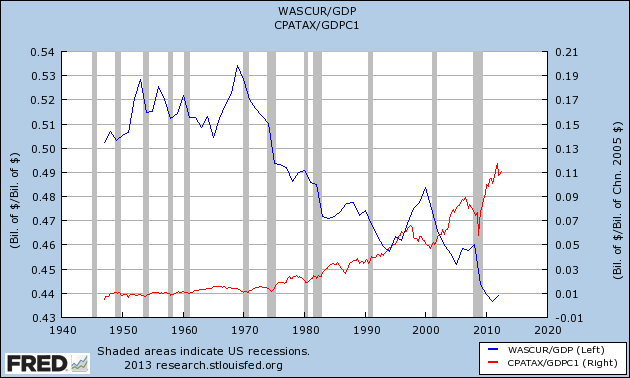 Since the ’70s, wage share of GDP has crashed, with a happy exception of the Clinton years, while relative profits have soared. This is tautological, when relative wages fall they are either replaced by capital income, which accrues in the hands of a few, or by greater profits. I agree with Matt that, by itself, this is a good thing. Technological efficiency is always good and we shouldn’t forsake science and capital improvement to avoid structural unemployment. But this graph also proves two things, not only do costs scale sublinearly with wages, but this is increasingly the case. The idea that increases in nominal income will eventually result in real cuts due to price increases is false, and getting falser. There’s another point to be made with this graph. The latter-day cash hoarding, as indicated by the almost vertical red-line after the economy bottomed-out, means that even if wages increase, output will remain largely unchanged, and relative profits might decline. Matt concludes that the real way to drive real income is with technology and increased capital output, together driving down relative prices and hence increasing real income. This is perfectly true, but misses an important point: the same reason increases in nominal wages are not fully undone by corresponding price increases, as per the standard neoclassical model, decreases in nominal wages will result in falling real income. All this isn’t to say that the Left hasn’t made a “big mistake” regarding wages. The real problem among the Left is an aversion to capital and technology. Where Matt and I see lower prices, many liberals see structural unemployment. The real challenge of governance in this century will be the transition from wage-intensive income to capital-intensive income, as the above figure painfully demonstrates. In the postwar era, America embraced the idea of a “property-owning democracy” through various schemes to promote homeownership. We need to embrace the idea of broad capital ownership. Some radical ideas might be a lump-sum provision of stock at the age of majority: at least then the median worker can take some pleasure as capital incomes rise.